Universiti Brunei Darussalam (UBD) and King's College London (KCL) with CIAT and HEIG-VD have recently established successful research collaboration on Terra-i deforestation monitoring system for South East Asia. The collaborative project is to support the iCUBE initiative, formally established by UBD in 2010. iCUBE (The International Consortium of Universities for the Study of Biodiversity and the Environment) aims to bring together a core group of research universities from around the globe to form a consortium to address research and education issues and problems related to biodiversity and the environment. The UBD team currently involved in the research collaboration are namely: Saiful Azmi Husain (Project Leader), Lalit Dagar, Sandhya Aneja, Abdul Ghani Naim, Jose Edgardo L Aban & Nagender Aneja, whereas Mark Mulligan (Project Leader) and Louis Reymondin are from King's College London (KCL). The first phase of the collaborative project on deforestation monitoring system is knowing where tropical deforestation accurately occurs in a timely manner that permits rapid action to address the root causes. Terra-i is the first ever moderate resolution operational deforestation monitoring system outside of Brazil. It provides 16-day updates for land cover change at 250-meter resolution and updated datasets in Geographical Information System (GIS) formats are made available to a global user community every two months. Terra-i is now currently running for South East Asia with a processing centre at the UBD|IBM centre. The outcome from the collaboration is expected to produce pan-tropical results of tropical deforestation over South East Asia over the next few months. Initial tests are encouraging, indicating that the system is working reliably in other tropical forest contexts. Figure 1 shows deforestation 2004-2013 for India and Nepal and Figure 2 2004-2012 for Borneo. Terra-i has been operational for the whole of Latin America (Mexico to Argentina), with a processing hub and distribution system based at CIAT since December 2011 and was officially launched at Rio+20. It was developed by Louis Reymondin who works with Andy Jarvis and his team in the Decision and Policy Analysis unit of the International Center for Tropical Agriculture (CIAT, Colombia) and is PhD student at King's College London, supervised by Mark Mulligan in the Department of Geography. Terra-i is the result of a collaboration between CIAT DAPA, King's College London, the University of Applied Sciences of Western Switzerland (HEIG-VD) (Andres Perez-Uribe) and is funded by The Nature Conservancy. Figure 2. 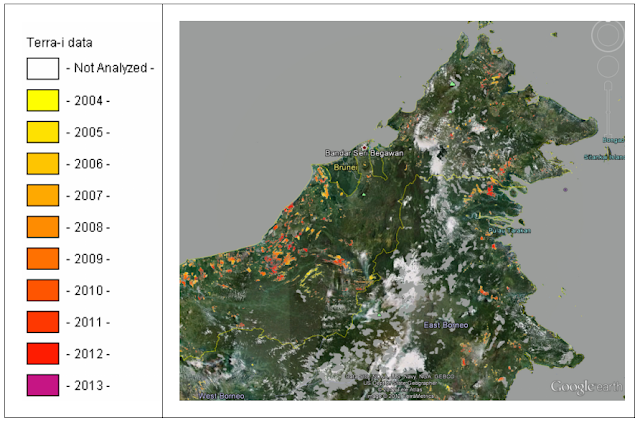 Deforestation in Borneo 2004-2012, according to Terra-i.